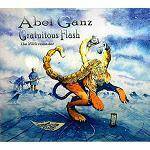 The 2016 remix of the very first Abel Ganz album + bonus Alan Reed solo version of "Kean On The Job"
More information: This is the 2016 remix of the very first Abel Ganz album, "Gratuitous Flash". Abel Ganz have built up a well-established international reputation as a preforming and recording band since 1982. The album features one of the band's most iconic tracks, "The Dead Zone" and was remixed by band co-founder Hew Montgomery during 2016 at Southpark Studios in Glasgow. The original audio has been kept in the mix and has been augmented by additional sounds and keyboards. There is also a BONUS TRACK, with Alan Reed's superb solo arrangement of "Kean On The Job" added to make this recording a unique product. All the original members of the band were involved in this remix/remaster. HUGH CARTER - bass, flute, bass pedals and backing vocals - Hugh co-founded Abel Ganz in 1982 with Hew Montgomery and played on and off with the band until 2010. He is a well known face on the Glasgow music scene with his music shop CC Music and recording/rehearsal studio, The Practice Pad. Hugh is also a seasoned campaigner on the gigging circuit. He is now retired and concentrates on his solo project, Glen Brielle. HEW MONTGOMERY - keyboards and backing vocals - Hew was the other co-founder of Abel Ganz in 1982 and claims all responsibility for the band’s name! In 2007 he left to focus on his solo project, Grand Tour. He records and produces with a number of local projects, and is currently working on the second Grand Tour album at his Southpark Studios in Glasgow. MALCOLM McNIVEN – guitars - Malcolm was part of the original Abel Ganz which recorded ‘Gratuitous Flash’. He then spent the next few years in the revolving doors of the band line-up working finally on ‘The Dangers of Strangers’. Since then he has been involved in traditional Scottish music, playing acoustic guitar and mandolin in all sorts of places including a racing yacht (while racing!) and at a Viking festival. KEN WEIR – drums and percussion - Ken joined Abel Ganz in 1983 and played with the band until 1986 when he left to pursue his career. Ken was recently tempted out of the musical wilderness to join Scottish prog rockers Long Earth alongside another former Ganzer, bass player Gordon Mackie.